Account for the attractiveness of eugenics amongst left-wing social reformers Eugenics has often been dismissed as an ideology of the right. It was, at best, nothing more than an extension of social Darwinism which naturalised and sought to maintain the existing social arrangement1 of laissez-faire capitalism, and, at worst, the pseudo-scientific justification for racial prejudices which ultimately sanctioned the atrocities perpetrated by the Nazis. More recently, however, increasing attention has been paid to the fact that many left-wing thinkers, among them Marxists and Fabians, lent their enthusiastic support to eugenic ideas. 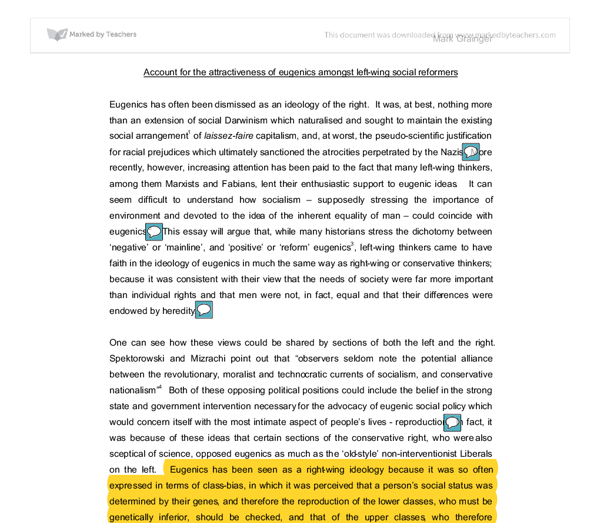 It can seem difficult to understand how socialism - supposedly stressing the importance of environment and devoted to the idea of the inherent equality of man - could coincide with eugenics.2 This essay will argue that, while many historians stress the dichotomy between 'negative' or 'mainline', and 'positive' or 'reform' eugenics3, left-wing thinkers came to have faith in the ideology of eugenics in much the same way as right-wing or conservative thinkers; because it was consistent with their view that the needs of society were far more important than individual rights and that men were not, in fact, equal and that their differences were endowed by heredity. One can see how these views could be shared by sections of both the left and the right. ...read more. In a society in which the social structure denied equal opportunities for all, it is impossible to distinguish between genetic endowment and environmental influences. He, and others, looked to the Soviet Union as a place not only where scientific development would be encouraged16, but also where, in a society believed to be offering equal opportunities to all its members, true eugenics could be carried out. In 1935 Muller wrote Out of the Night, a book in which he argued that in just a century or so, it would be possible for the innate genetic quality of the majority of the population to be increased to the level of such men as Lenin, Isaac Newton, Leonardo Da Vinci, Louis Pasteur and Beethoven. In reviews of the book, according to Diane Paul, nobody questioned the science behind this idea. It seemed to be accepted that traits were substantially determined by heredity, and that the mechanisms involved were well enough understood that they could be consciously manipulated to such an efficient degree that these results could be achieved within two or three generations.17 Of course, this depended on the above-mentioned society in which social mobility was free and unimpeded by class concerns. It could be claimed that socialism was a necessary pre-condition for eugenics because as Julian Huxley wrote: "... ...read more. This example demonstrates that 'mainline' eugenic ideas were compatible with left-wing thought. Indeed, it was acknowledged by Haldane in 1938 that attitudes towards eugenics were not delineated along the usual left/right divide; "The questions with which I shall deal cut right across the usual political divisions".30 Hence we find members of both these political groupings agreeing with each other in either their support or their opposition to eugenics, and social democratic countries such as Sweden or Denmark supporting the 'negative' eugenic practice of sterilisation while Britain never did do so. 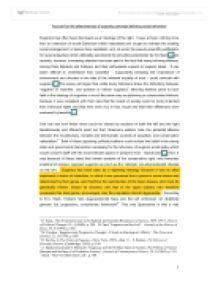 Hence I find the separation ideas into categories of 'left' and 'right' or 'positive' and 'negative' not useful when discussing the appeal of eugenics. Freeden argues that it was the allowance for environmentalism in Galton's first definition that attracted the left to eugenics. I would argue that this is something that they contributed to the field, but, with the possible exception of France, left-wing thinkers' original support for the creed sprung from their enthusiasm for state intervention and the chance to create a genetically planned society, which could only develop from their belief that the salvation of mankind was bound up with the improvement of its genes; that a person's 'fitness' was determined by his biology and the manipulation of his environment was useful only to ensure that the best genes were available for selection. ...read more. This student written piece of work is one of many that can be found in our University Degree 1900-1919 section. This essay covers the content well and is well written. It could be improved by exploring some of the issues in more detail, and considering the role of other entrenched influences in affecting the course of eugenics in Britain eg. how did the existing social improvement movements such as the public health movement interact with eugenics? What do you understand by the notion of an invented tradition? (Proclamation of the Republic of Ireland, p181, AA100 set book 2), had not existed in its purest form for many hundreds of years, having been invaded, occupied and suppressed, first by the Anglo-Normans in the 12th Century, and most recently by the British Empire. What factors contributed to the rise of fascism in Europe? Despite President Wilson's 'Fourteen Points', formulated in January 1918, the Allied powers excluded Germany from negotiations over the peace settlement, allowing only limited written comments on a draft version of the treaty, and put forward a much harsher deal than had been anticipated. Was the First World War Planned or the result of accident and miscalculation? Gordon argues that 'German leaders did not consciously aim at it'3, but that world war merely emanated from continental war in 1914. The previous German generation were 'devotees of the world policy'4, devised by Bismarck but taken up and massively extended by his successor Kaiser Wilhelm II. League of Nations - Good or Bad? The Senate supported most of the treaty such that it guaranteed principles of the Monroe Doctrine be extended throughout the world giving America "superiority in the Western Hemisphere." (Schulzinger, 2002) However, they did not support the League of Nations, because they it would make the U.S.
To what extent can Kaiser Wilhelm's reign 1880-1914 be characterised as 'personal rule'?